In his ruling yesterday, Justice Kolawole, said he found no merit in Tarfa’s objections, noting that it would be in the interest of justice to admit the exhibits into evidence. Marking the CD’s as exhibit P8, P8(a) and (b) yesterday, the trial judge, however stressed that its contents will be ascertained in the cause of the trial, adding that contrary to argument of the defence counsel that they are in the category of public documents, the judge maintained that in-line with section 43 (1) (a-b) of the 1999 constitution, the call logs are not such that any network provider can reveal to individuals except in relation to an investigation of criminal allegation. The judge said it would have been different assuming the witness was not the maker of the evidence, even as he adjourned the case till February 7 and 11, 2013, to enable the defence counsel to cross-examine the witness. Specifically, Ndume is being prosecuted by the Federal Government on allegation that he furnished the Boko Haram sect with classified information that aided their terrorist operations in the country. He was arrested by the State Security Service, SSS, on November 21, 2011 and docked before the high court on December 12, sequel to his indictment by Konduga, who fingered him as one of their major sponsors. According to the federal government, the offence he committed was contrary to section 7(1) (b) of the Terrorism (Prevention) Act, 2011 and punishable under Section 7(1) of the same Act. 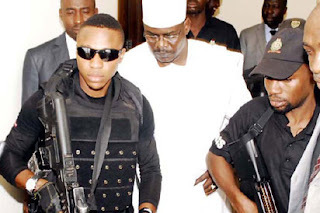 Though the security agency said its investigations revealed that it was Ndume that submitted phone numbers of top government officials, including that of the Attorney General of the Federation, to the Boko Haram sect, however, the lawmaker who spent 26 days in detention before he was eventually granted bail by the court, has since denied the allegation, describing it as baseless.